A fixture of the wrestling card world, the hit-filled 2019 Topps WWE Undisputed Wrestling works in eight autograph cards and two relic cards in every Hobby box. It may no longer be the ultimate option in WWE cards, having ceded that title to 2019 Topps WWE Transcendent Collection, but Undisputed still holds a key spot with collectors thanks to the many on-card autographs and premium format. Much more subtle compared to the 2018 design, the base set highlights top subjects from the Men's and Women's Division, plus WWE rookies and the first NXT cards for the rising talent, all printed on 48-point stock. Featuring 10 of the biggest WWE Superstars, the all-new Rob Schamberger Portraits set provides an artistic look at wrestling's elite. Base parallels include Orange (#/99), Green (#/50), Blue (#/25), Gold (#/10), Purple (#/5), and Red (1/1) versions, as well as Printing Plates (1/1). 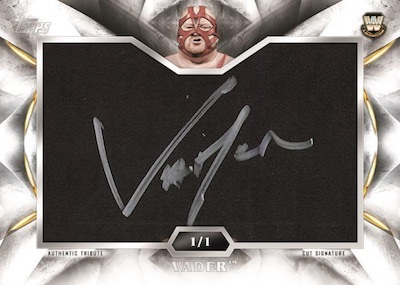 An important part of the 2019 Topps WWE Undisputed Wrestling checklist, the hard-signed Undisputed Autographs line features on-card signatures for some of the best men and women in the ring. These cards also have Orange (#/99), Green (#/50), Blue (#/25), Gold (#/10), Purple (#/5), Red (1/1), and Printing Plate (1/1) editions. Low-numbered choices include Dual Autographs (#/25) and Triple Autographs (#/10). Dual adds Gold (#/10) and both multi-signed sets have Purple (#/5) and Red (1/1) parallels. The Cut Signatures (1/1) cards cover the all-time WWE greats. Another hit possibility in 2019 Topps WWE Undisputed Wrestling, most relic cards work with Superstar-worn shirt pieces. The Undisputed Relic and Undisputed Autograph Relic cards are each numbered to 99 and are joined by Green (#/50), Blue (#/25), Gold (#/10), Purple (#/5), and Red (1/1) parallels. Booklets are another premium option, including Autographed Kiss & Jumbo Shirt Relic Book (#/5) and Quad Autograph Book (#/5) cards. 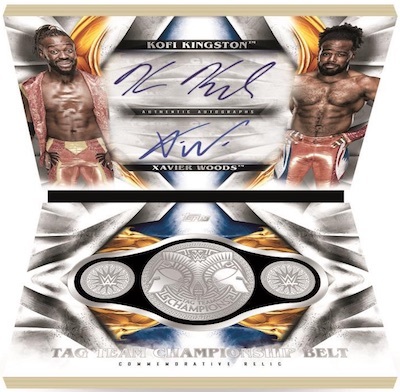 The new Tag Team Dual Autograph & Championship Book cards have commemorative belt medallions honoring tag team champs.